Now that Graduation season is upon us we have added many new designs. We have also added a lot of new color your graduation cards. 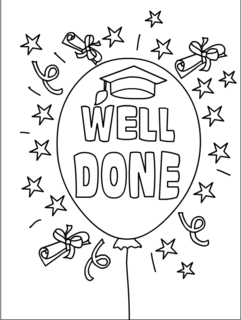 So weather you want your kids to color them or just print out a fully designed card do hop over to our printable graduation cards site. Our site is always free and we do not ask any of your personal information. As all of you must know Mothers day is on May 8th. Are you ready? Even if you have planned for a nice Mothers day brunch for your mom. It never hurts to send her some mothers day animated ecards for this special occasion. We have a very thoughtful mothers day ecard like this one which express our thoughts in words. Or you can send this idyllic mothers day card. So go ahead and spread the joy and thanks!